After all of the courses and hours upon hours of work to become a teacher, there is just one hurdle left: the New York State Teacher Certification Exams. Gaining confidence and competency through taking the best NYSTCE practice tests is an excellent way to combat test anxiety, according to the AADA, or Anxiety and Depression Association of America. Knowing that you are prepared helps you enter the test with a positive attitude, another way to combat anxiety. Stanford University Medical Center published research in January, 2018, that “identified the brain pathway that links a positive attitude toward math with achievement in that subject” (sciencedaily.com). If a pathway exists linking a positive attitude and achievement in math, it makes sense that a positive attitude might help people achieve in other areas. Highly effective NYSTCE test prep means you are likely to pass the test the first time, saving yourself time and money. Retakes are given only after wait times of 30-60 days. The second or third tests cost the same as the first test ($92-$134 for most tests). Let’s face it: some of you have been attending school for 16 years. Others wish that it had only taken 16 years to realize you wanted to teach. Some of you are choosing teaching as a second career. Still others have never had a true career, working at jobs that never seemed like careers. You are so close to having your own classroom! After all the coursework, you may know all of the information needed to teach in your chosen field. The NYSTCEs ask you to apply that knowledge in order to gain certification. Are you prepared? Stories of candidates who thought they were prepared and still failed the test abound. It’s enough to make you wonder, does anyone actually pass the test the first time? Yes. Teachers pass certification tests in New York every year, some on the first try. But are you willing to take the chance on passing simply because you think you know the information? That type of confidence and positive attitude may work against you! Here’s why: it’s not just about knowing the material. It’s also about knowing the test. If you do not pass, consider this: you have just lost $188 to $268 (the cost of two tests; add more for each certificate). More importantly, you have delayed the chance of getting a certificate for 2-3 months (add scoring time to the mandatory wait time between tests). According to the New York State Department of Education, in a 3-year period between 2013 and 2016, only 65% of test-takers passed without the Safety Net. 30% passed with the Safety Net scoring. But over 1,700 candidates failed the test even with the Safety Net. Are you willing to take that chance? Will My NYSTCE Study Guide Help Me Determine If I’m Prepared? In a handout called “Fear of Failure”, the American Board of Perianesthesia Nursing Certification lists “The three things you need to be successful in reducing test anxiety.” Though you are not taking nurse certification tests, these three ideas will help you become certified to teach. Adequate Preparation: learn what the exam covers and identify the areas of study that need the most attention. Preparation is tied to confidence. Confidence helps overcome anxiety. Strong Organization: create a structured study plan that covers all of the material in manageable allocations of time over several weeks leading up to the exam. Proper Practice: practice similar test questions and practice pacing yourself. Practicing the timing of test sections will lead you to feel more comfortable when you take the exam. Your first step may begin by knowing the framework of the test or tests you need to pass. Each test’s framework is found at www.nystce.nesinc. Find the test you need. Then choose “Preparation Materials.” You will see a link to “Test Framework”, a PDF which breaks down that test into competencies and gives the percentage of selected response and constructed response questions in your particular exam. Look very carefully at the competencies. Do you feel confident that you not only know them but that you can apply your knowledge? If you read each competency and can anticipate how it will be converted into a test question, you are there! The brief prep test offered on the site may be all you need. If you read the competencies and have no idea how they can translate into test questions, you want to do all you can to ensure you prepare. Though there are sample questions for each test on the nystce.nysinc site, they offer only a sample, not a full practice test. Here is where a good NYSTCE study guide or prep book can help you navigate the test and boost your competence and confidence. Be sure your review book has at least one full set of NYSTCE practice test questions. The sample exam must accurately reflects the wide range of competencies measured on your exam. Plus, the NYSTCE practice questions should look like the real test. That means NYSTCE test study guide has practice exam questions that have similar wording, structure and are at the same level of difficult as the bona-fide exam. Many teaching candidates fail the NYSTCE exam at least one time—some as many as four or five times. Why? Some say there is too much information to study and not enough time to sort through it. Others say the questions seem tricky. Still others procrastinated or became paralyzed by not knowing where to begin. 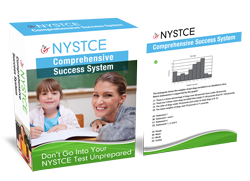 Many of those candidates have passed the test since then by using NYSTCE books to help them fully prepare. 1)	The EAS or Educating All Students Test is a 2 hour 15 minute timed exam with 40 selected-response (multiple choice) and 3 constructed-response (written) items. This exam costs $92. 2)	The CST or Content Specialty Test is a 3 hour 15 minute timed exam with 90 selected-response questions and one constructed response questions. Currently any science content area (biology, earth science, chemistry or physics) requires a 4 hour exam. These exams are being revised to fit the 3 hour 15 minute format. The CST costs $134. *NYSTCE requires listening, speaking and writing portions on language certification exams. For school building leader, school district leader and school district business leader, there are two tests of four hours each, costing $351-$427. The tests can be taken separately or scheduled in one 8-hour day with an added 40-minute lunch break. What Do I Look for in a NYSTCE Test Study Guide Book? Pick up a NYSTCE study guide or prep book at the bookstore. Check the Table of Contents or Index for the key factors: adequate preparation material, organization tips, and proper practice. Follow this guide, based upon tips from reviewers on the web who have used NYSTCE study materials. Does the NYSTCE book explain your specific test’s framework and competencies? Compare the text’s information with what you find on the nystce.nysinc site. Using an EAS prep may not prepare you to take the agriculture content certification exam. Do the questions follow the NYSTCE’s framework for your test? Is the NYSTCE study manual updated? And are there revisions on the information, not just a revised copyright date? Current revisions are occurring in the science content areas (biology, chemistry, earth science and physics). Also, the EAS is being revised with an Office of State Assessment (OSA)selected response committee meeting set for August 2018. Does the NYSTCE exam study guide offer a plan to organize your study time? Finally, look carefully at the practice tests and answer keys. Is there more than one practice test, actually allowing you to practice? Is there a test time listed for each practice test? Are the answers explained, both the correct ones and the incorrect ones? Are rigorous constructed-response questions included that are tied to your NYSTCE competencies? Are the scoring rubrics for your test shown? Are the rubrics explained clearly? If you can check “yes” for these questions, the study guide or prep book can help you. What’s the Best Way to Use Your NYSTCE Book To Pass Quicker And Easier? First, take the NYSTCE practice test on the www.nystce.nesinc.com site. Know what you do not know. Don’t spend time studying what you already know, even if it makes you feel better! Then mark the spots in the prep material that can help you study your weakest areas. Organize your NYSTCE study time. Researcher Dave Putwain researches how psychological factors influence and are influenced by learning and achievement. In his work, he found that the word stress can mean any negative effect exams can have. This includes time pressure, multiple exams the same day, preparing for exams while still doing coursework, and interference on relationships and social activities. Sound like you? Organizing can help! Most New York State Teacher Certification Examinations last 2-4 hours, but your NYSTCE study time may be a series of focused 20-minute periods. A February 2017 article, “Rethinking the use of tests: A Meta-Analysis of Practice Testing” analyzed 118 studies that said this: use many short practice sessions and take some time between them. Don’t cram for days. Doing this allows your long-term memory to store information. *This is also the best strategy for those who have families, hold down jobs, and/or are still student teaching or working on other coursework. If you think you need huge amounts of time to study for the NYSTCE, it may lead you to procrastinate or be paralyzed by the overwhelming task of studying. In your NYSTCE study guide, use the practice tests and answer keys to focus on timing as well as correct answers. The more closely this resembles the actual test, the better prepared you will be to manage your test time, one of the main problems mentioned by candidates. Remember: the EAS contains 40 selected-response questions. Content-area tests may have 50-90 selected-response questions. Which of the questions take you the most time to answer? Why? Look for reasons you stumble on those types of questions. Solve that puzzle and you will overcome the time issue. Don’t just passively read your NYSTCE study guides or mindless taking practice questions. Spend some time reading the reasons each incorrect answer is wrong. According to users, knowing the reasons an answer is wrong can help you recognize patterns in wrong answers. If you can see why some types of questions always “trick” you, you can correct that problem. Look carefully at the way words or phrases in the questions and the answers can point you to the correct choice. Remember: you know the material. The test is about application. Compare your constructed response(s) to the rubric. Honestly. How can you turn your “2” into a “4”? If you are unable to gauge your score, ask for help. Remember that each NYSTCE contains at least one constructed response question. 5.) How To Identify Test Prep Challenges And Make Plans To Solve Them Now. For example, if there are situations and people who keep you from doing the preparation necessary to pass, make a written plan how you’re going deal with that before it happens. If you wait until the situation is upon you, you’ll make it more difficult for yourself. If test anxiety or feel you’re ‘just not a good test taker’ make a short, written plan on how you’re going to find resources and develop skills to greatly reduce these obstacles to your passing score. Planning upstream and being proactive to solving barriers to your passing score is the only way to guarantee you pass the NYSTCE exam. There isn’t much time. The clock is ticking so take action now! Whether you’re still in school or have a busy career to contend with, finding the time to devote to your study for the NYSTCE around your already-busy schedule can be a challenge. These scheduled study sessions will serve as a block time. You won’t do anything else, but prepare. This helps keep procrastination and interruptions at bay. This way, you’ll ensure that you stick to your study schedule and don’t lose weeks of precious review time little by little in low value activities and time wasters. Make your NYSTCE test practice social. Even the most sincere intentions to crack open your NYSTCE study manual can be punctuated with family responsibilities and an active social life. While it’s extremely tempting to put aside your preparation materials for a night out with friends, don’t fight against your instincts. Instead, form a study group that will fulfill both your social needs and test prep needs. If you have a family, why not get them involved while you read your practice for the NYSTCE? Invite your children and/or partner to quiz you so that they feel involved with the process – and you’ll find it much easier to balance both aspects of your life. It’s no wonder that many posters on New York teacher testing forums feel as though they don’t have enough time in the day to devote to their New York teacher certification practice guides. However, it’s important to realize that a two-hour chunk of time won’t simply fall from the sky. Instead, you need to carve out the time you need from your day you need for prep sessions. Try taking your NYSTCE test prep books with you to work, where you can get in an hour’s worth of study during your lunch break. Carry your review resources around with you at school in case you can grab ten or twenty minutes for review. Record the information you most need to learn in your study guide into an Mp3 recorder. Listen to the content as you drive in your car, do errands, sit on the bus or other time you can wear headphones. Create and whip out some flashcards when you’re eating dinner, waiting for an appointment or have few minutes of idle time. …You’ll be surprised how all the otherwise wasted minutes of the day add up hours of high quality review. The best NYSTCE guides are those that teach you only what content is really tested, not a slew of general academic knowledge. You just don’t have time to learn the finer points of various concepts if they won’t help you get your New York state teacher certification. Be wary of national publishers who print NYSTCE exam review guides. Most are authored by corporate writers who edit novels and books like “how to garden for Dummies.” Even the ivory tower PH.D.s in education they contract to write study guides haven’t taken a standardized exam in 20-30 years. …He never passed your NYSTCE test! Free NYSTCE exam study guides online aren’t going to give away the test. These are a sample of ‘may be’ material and mostly general academic information. If you’re really serious about passing your teaching exam, get preparation materials created by New York teachers who passed and have several years of experience helping test takers succeed. The most powerful New York State Teacher Certification Examination preparation programs are those that combine study guides, practice tests and one-on-one coaching and tutoring. Organization is a skill that every teacher needs. But even if you have been too busy to begin studying until shortly before your exam, good NYSTCE study guides can help. Many candidates have purchased NYSTCE study materials just days before their exam. They succeeded, because they chose prep books that matched the criteria listed above and didn’t waste time going in the wrong direction during their review. By using the NYSTCE study guide techniques others leveraged to pass, you can successfully make it past that last hurdle and be one step closer to having your own classroom! NYSTCE Test Prep – How To Combat Test Stress With These Practice Tips No matter how ready you think you are for your field based, computer or paper testing, your New York State Teacher Certification Exam can cause you a lot of stress. Even the most self-assured and knowledgeable test takers become extremely nervous. Does the thought of your NYSTCE exams? make you feel nervous? Experts have dug up plenty of testing research that shows people experience stress primarily because they don’t feel in control. Since taking a standardized test like your New York teacher certification exam causes many test takers – no matter how well they might have done on tests in college – to feel completely out of control, it’s no wonder that stomach butterflies are an epidemic. Don’t let poor NYSTCE practice test study guides steal your teaching career dreams. If you want to manage your anxiety on the day of your CST test, then you need these top stress management and preparation strategies. It doesn’t matter if your teacher license assessment is Mathematics, Social Studies, Bilingual Education, Liberal Arts And Sciences (LAST), Health Education, Social Studies, Earth Science, Elementary Assessment of Teaching Skills Written, Secondary Assessment of Teaching Skills Written, English to Speakers of Other Languages, English Language Arts, NYSTCE Students With Disabilities, Multi-Subject and Sciences or one of the others. The following test prep advice is so effective that they’re guaranteed to nip those stomach butterflies right in the bud. It seems like a contradictory concept, but the more you ease up on your NYSTCE exam study before the big day, the better you’ll do on your test. Easing up on your review schedule three days before this educator assessment will make you feel more rested and relaxed. In other words, cramming the night before won’t just make you feel tired – it can actually increase your feelings of being stressed! While becoming familiar with the layout of the test center won’t replace doing sample questions and reading your study manual, it can work wonders on any potential nerves you might experience on your testing date. Know where you’re going ahead of time: get directions to the center, time how long it will take you to get there and visit the room where you’ll actually take your teacher certification test. Ever wonder why athletes don’t practice the day before a game or race? Be it an Olympic race or NYSTCE examination, our bodies need approximately 24 hours in order to gather up the energy and resources that we need to succeed. Don’t deplete your resources the day before your test – instead, do things that you enjoy to give your mind and body a well-deserved day off. Stress can quickly mount when you realized you have so much to do and so little time a few days before you walk into the test center. Have a little foresight to get those errands out of the way before your testing date. Fill up the gas tank of your car, lay your clothes out in advance and above all, get directions to the testing center ahead of time. The peace of mind you’ll feel with all of these completed tasks under your belt will do much to get your relaxed and ready for test day. Don’t let your nerves get in between you and your future teaching career – not to mention that healthy New York state teaching salary. There are a number of effective NYSTCE prep techniques that you can use to fill your head with the content knowledge you need to breeze through your exam. 1.) Organize Your NYSTCE Study Priorities No one excels at everything. There will inevitably be some subjects at which you are stronger and others at which you are weaker. You’ll need to make sure that you spend more time memorizing and learning in your weaker areas than in your stronger ones. Don’t worry if it looks like there’s a huge difference between the amount of work you have to do to prepare for the NYSTCE test and the amount of time you have to do it. It is important to use a professionally prepared NYSTCE study guide that includes quality NYSTCE practice test questions. The next step will be to chop down the work. 2.) Pick and Store Once you’ve identified those areas that will need the most work, read all the information in your NYSTCE manual through once. Highlight the most important points (don’t just underline: it’s easier to picture a highlighted page than an underlined sentence). Break up what you need to learn into bite-sized chunks. There’s a limit to how much you can stuff into your short-term memory in one go. Take each piece a little at a time. Acrostics help you remember lists in the right order by turning them into strange sentences. My Dear Aunt Sally is the famous way to remember to Multiply and Divide before you Add and Subtract. You can create your own acrostic for any set of facts. Turn your notes into notes. If you can put the words you’re trying to memorize to a tune you like, you’ll find them much easier to remember. You might not be able to hum in the exam, but you can sing in the shower — and in the process, keep memorizing for the NYSTCE exam. 3.) Get It Rammed Right In There! Cramming only puts the information you want in your head for a short time (using what you’ve memorized will keep it there for the long term). In order to keep what you’ve memorized from falling out before your exam, you’ll need to keep seeing it and going over it right up until you need it on the day of your NYSTCE test. It is never too early to begin studying for your NYSTCE test. Whatever you do, don’t play the game of seeing how long you can procrastinate your NYSTCE study and still pull off a passing score. Almost every New York State Teacher Certification test taker says they said they wish they would have started preparing at least 1-2 months earlier.